I used to love visiting San Diego. Great beaches, great weather, bars, food...but I realized the main reason I returned there again and again was for one thing: Alpine Nelson. But I don't need to wait for the Southwest Click N' Save alerts anymore: Nelson is here. Along with Hoppy Birthday and Duet, as evidenced by the horrible picture I took when seeing them at Jubilation. 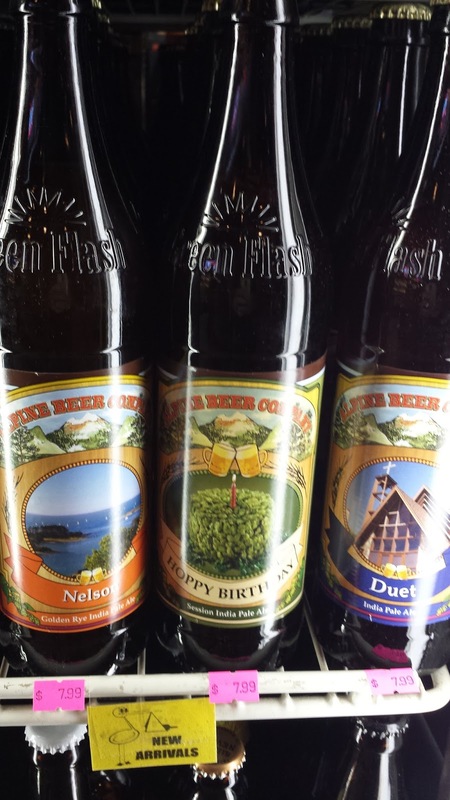 We can thank Green Flash for getting them here (about the only thing worth thanking Green Flash for lately) after their acquisition of Alpine. 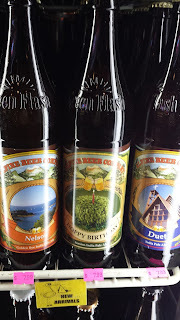 We've seen the random keg of Hoppy Birthday and Duet in town since the move, but none of those telltale Alpine labels. Walking into a store and seeing those babies on the shelf suddenly had me back in San Diego...until I walked outside and didn't see palm trees. Or an ocean. Just a Walgreens. So I may still venture back out to the coast, but for now, I'm happy to be able to drink their finest here in Albuquerque. Visiting for the next couple days. Only will be able to hit up 1 brewery (most likely Marble) What stores have the best craft beer selections around here? Cheers!